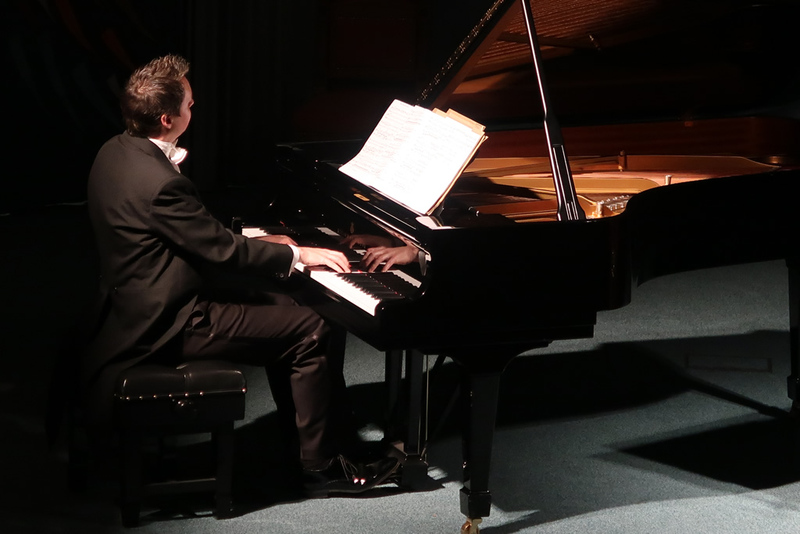 Eighteen months ago Penrith Music club ended its season with an exhilarating and entertaining concert of piano duets from the Scott Brothers Duo. Jonathan and Tom returned to present the second concert of the Music Club’s 75th anniversary season but in a slightly different guise. As well as being a brilliant organist and a skilful arranger, Jonathan is a champion of the concert harmonium, highly popular a century ago but since neglected. With Tom on the Music Club’s Steinway piano and Jonathan playing a 1901 Mustel harmonium, complete with polished walnut case and candles, this was a concert with a difference! The evening began with Jonathan Scott’s arrangement of Rossini’s The Barber of Seville Overture, its atmospheric introduction leading to a thrilling climax, with the themes passed in delicate interplay between the instruments and the full volume of the harmonium evident in typical Rossini climaxes. In contrast, Gounod’s Meditation – Ave Maria showed the full expressive range of the harmonium as it played Gounod’s serene melody while the piano presented Bach’s poetic C major Prelude as accompaniment. Later these roles were to be cleverly reversed. César Franck’s Prélude, Fugue et Variation is a great favourite of organists and it was interesting to hear this played in Franck’s own arrangement for piano and harmonium. The piece adapts easily to this format, the harmonium presenting Franck’s cantabile melody expressively as the piano plays the gently undulating accompaniment, simply in the Prélude and more flowing in the Variation. The Fugue is dealt with simply – the harmonium playing the opening section and the piano joining in as the climax is reached. Perhaps the most intriguing part of the evening was Jonathan Scott’s arrangement of Debussy’s Prélude à l’àpres-midi d’un faune, particularly so as Debussy used a subtle and varied orchestral palette to describe the thoughts of the young deer on a languorous summer afternoon. Debussy concentrated much of his descriptive writing in the wind section of the orchestra with strings and harp playing a supporting part. Here the harmonium was cast in the former role, its contrasting wind stops and expressive range again to the fore, while the piano added the ebb and flow and the harmonic subtleties that help to make this such an attractive work. This was a skilful and convincing arrangement of an exquisite piece, and quite beautifully played. In their previous concert in Penrith Tom and Jonathan had played Saint-Saëns’ Danse Macabre as a piano duet. Here it was presented as a brilliant and highly effective showpiece for piano and harmonium. An equally virtuosic arrangement of Monti’s Czardas, with its contrasting moods and gypsy dance rhythms, was to follow. Saint-Saëns was one of many French composers of the latter half of the 19th century who enjoyed both writing for and playing the harmonium. His Six Duos for Harmonium and Piano are at the forefront of the repertoire for the two instruments. Powerful harmonium chords and a relentless and spectacular piano part (brilliantly played by Tom Scott) featured in the dramatic opening Fantasia and Fugue. A gentler Cavatine and a darker Choral, with the harmonium cast in its traditional hymn tune role, followed. 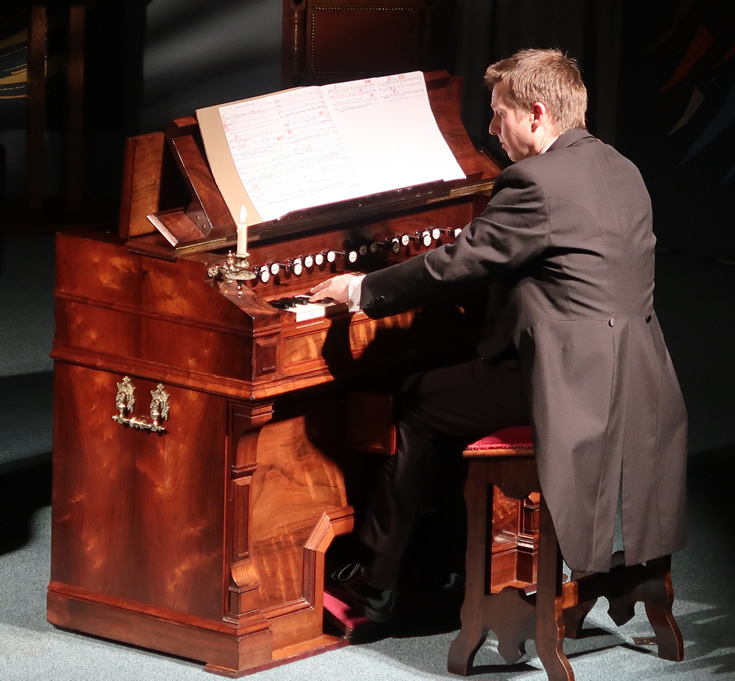 The versatility of the harmonium was featured in a light-hearted Capriccio and, after a sparkling Scherzo, a rumbustious Finale allowed both players to show the full range of their skills. After the pyrotechnics of Saint-Saëns, a beautifully-phrased arrangement of Debussy’s Clair de lune, written “a couple of weeks ago” by Jonathan Scott, sent a highly appreciative audience home with the satisfaction of having experienced another exhilarating, entertaining – and informative – evening from these two versatile and accomplished musicians.